ladyfingers | KBK Bakery's Adventures in Baking! I have had Tiramisu a few times before and never really thought it lived up to the hype so I wasn’t super excited when I saw it was February’s challenge. But I figured, what the heck, maybe I’ll like it better this time. Boy howdy! Did I ever! As has been proven to me many, many times before, homemade is infinitely better than anything store bought or ordered at a restaurant where desserts are concerned. I could easily have eaten the entire pan. Luckily I had my hubby and some friends over to help eat it. This is definitely going in the “make again” file! In a large mixing bowl (or stainless steel mixing bowl), mix together the egg yolks, sugar, the Marsala (or espresso/ coffee), vanilla extract and lemon zest. Whisk together until the yolks are fully blended and the mixture looks smooth. Have ready a rectangular serving dish (about 8″ by 8″ should do) or one of your choice. Mix together the warm espresso, rum extract and sugar in a shallow dish, whisking to mix well. Set aside to cool. Workings quickly, dip 12 of the ladyfingers in the sweetened espresso, about 1 second per side. They should be moist but not soggy. Immediately transfer each ladyfinger to the platter, placing them side by side in a single row. You may break a lady finger into two, if necessary, to ensure the base of your dish is completely covered. Spoon one-third of the cream mixture on top of the ladyfingers, then use a rubber spatula or spreading knife to cover the top evenly, all the way to the edges. Repeat to create 2 more layers, using 12 ladyfingers and the cream mixture for each layer. 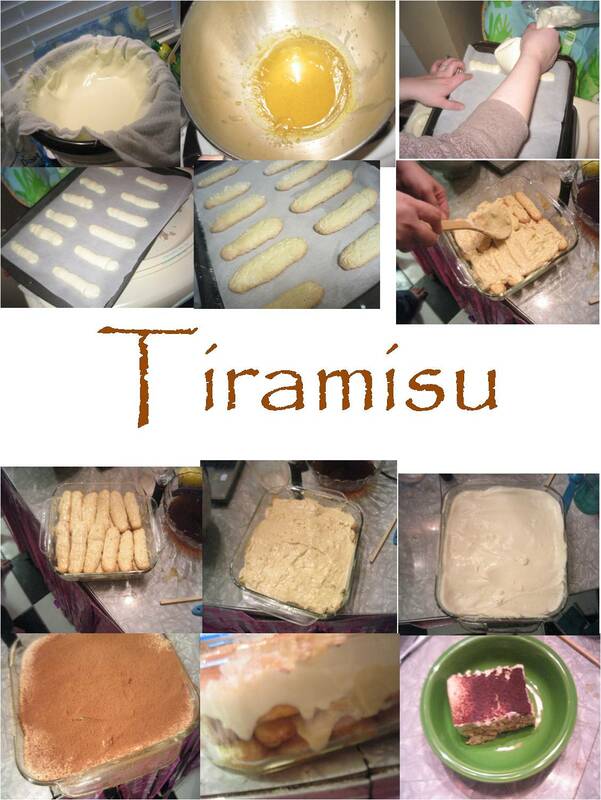 Clean any spilled cream mixture; cover carefully with plastic wrap and refrigerate the tiramisu overnight. To serve, carefully remove the plastic wrap and sprinkle the tiramisu with cocoa powder using a fine-mesh strainer or decorate as you please. Cut into individual portions and serve. It will take about 15 minutes of delicate heating. Add the lemon juice and continue heating the mixture, stirring gently, until the cream curdles. Do not expect the same action as you see during ricotta cheese making. All that the whipping cream will do is become thicker, like a well-done crème anglaise. It will cover a back of your wooden spoon thickly. You will see just a few clear whey streaks when you stir. Remove the bowl from the water and let cool for about 20 minutes. Meanwhile, line a sieve with four layers of dampened cheesecloth and set it over a bowl. Transfer the mixture into the lined sieve. Do not squeeze the cheese in the cheesecloth or press on its surface (be patient, it will firm up after refrigeration time). Once cooled completely, cover with plastic wrap and refrigerate (in the sieve) overnight or up to 24 hours. Vera’s notes: The first time I made mascarpone I had all doubts if it’d been cooked enough, because of its custard-like texture. Have no fear, it will firm up beautifully in the fridge, and will yet remain lusciously creamy.